I just want to take a minute to say this has seriously been one of the best posts to write! So long to the days where wrapping, hiding presents and trying to keep your life in order during the holidays seemed impossible. 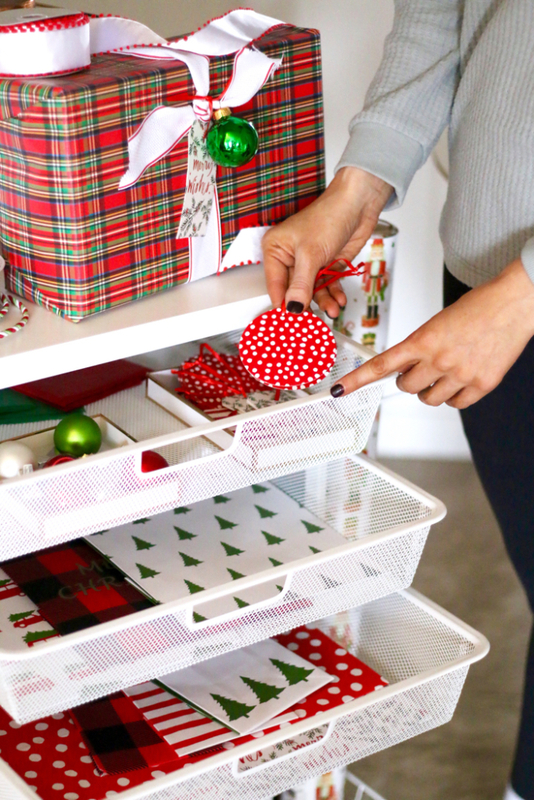 I’ve teamed up with The Container Store to share the most amazing hack for the holidays. That’s right, I almost have this season figured out, haha. 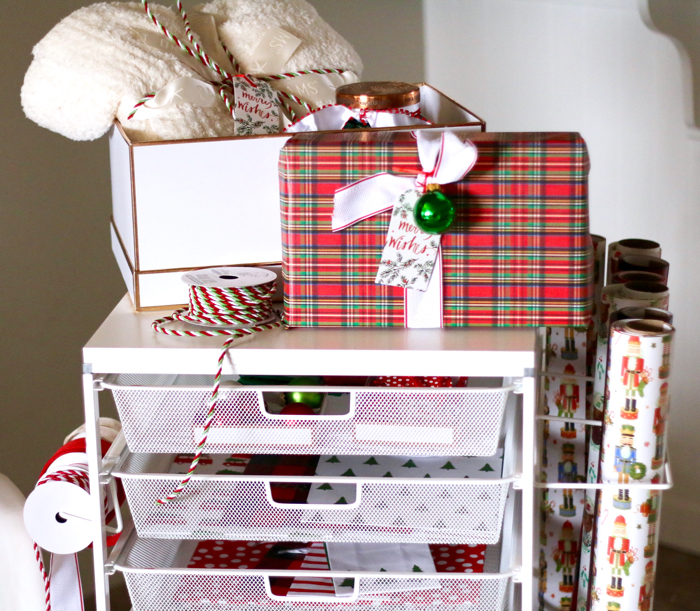 Say hello to my newest obsession, my holiday wrapping station. Everything is neat, organized and I’ve completely cut my wrapping time in half. It feels like Santa’s workshop in my basement. 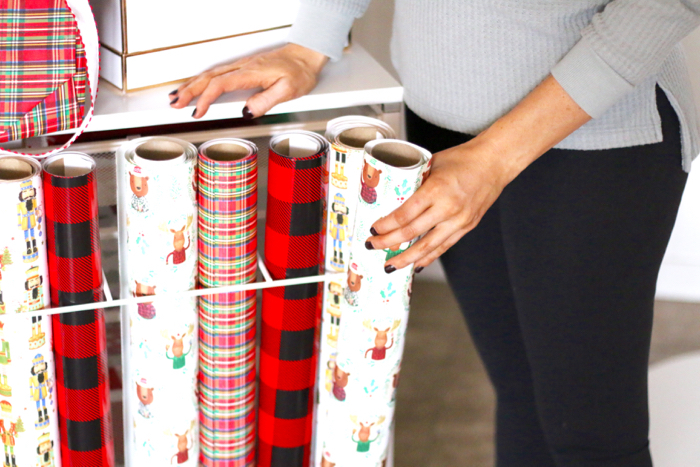 This is something I look forward to instead of dreading trying to find my wrapping paper, tape and finding a space in the house that I could create my workspace. I have loved The Container Store for years now especially around this time of year! 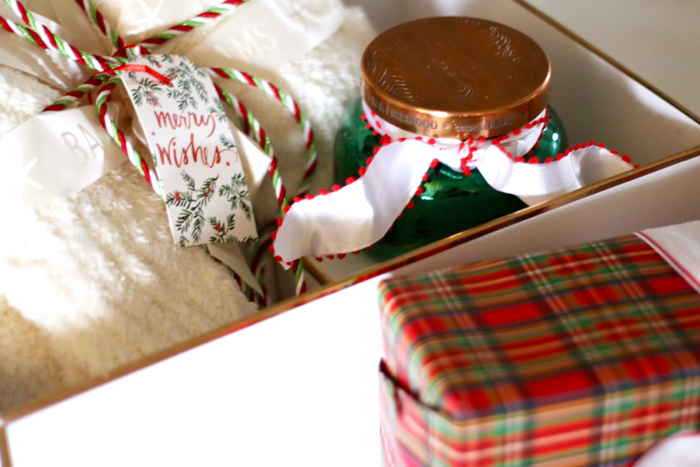 They have an amazing selection of all things wrapping, ribbon, gift tags, stocking stuffers, and of course the best way to organize it all! 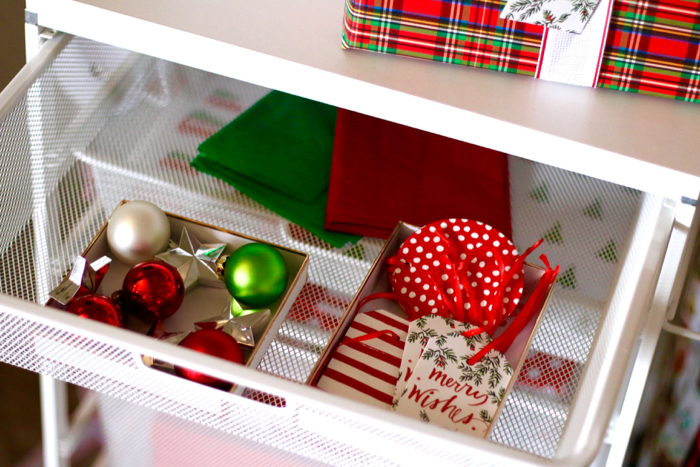 I love keeping things organized and in place especially around Christmas when you’re going a million miles a minute. 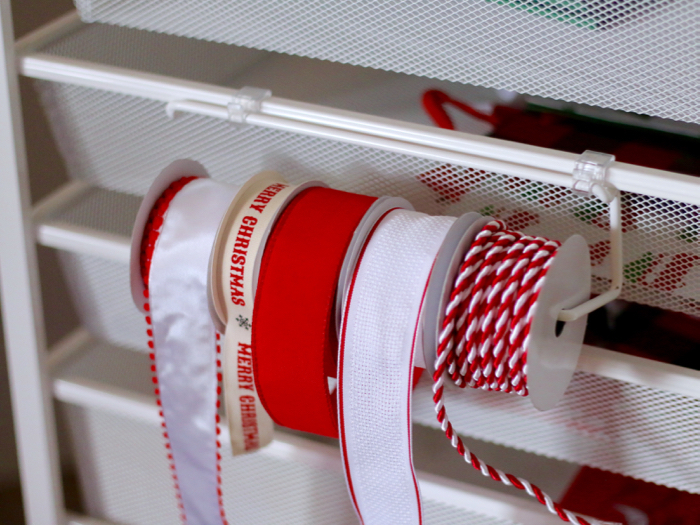 If you’re anything like me, you have your wrapping paper smooshed in a cabinet in your garage and all of it is unraveled and messy. 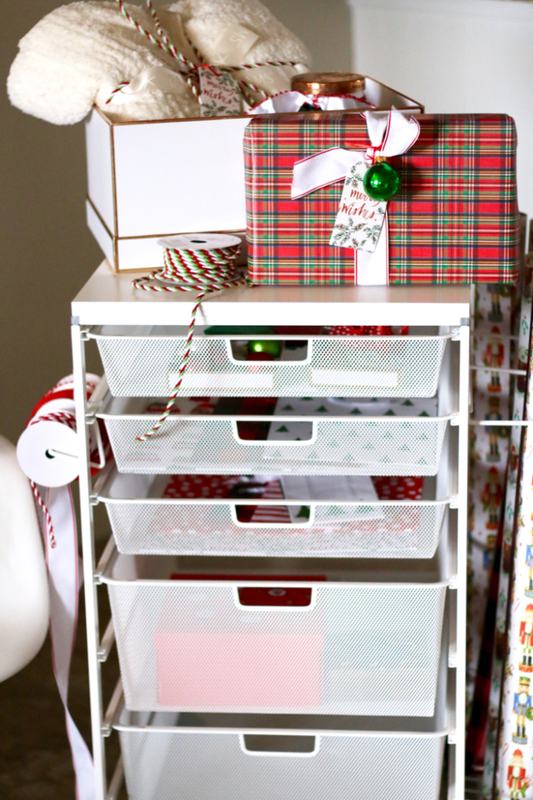 Guys, you NEED this Elfa Gift Wrap Cart organizer. 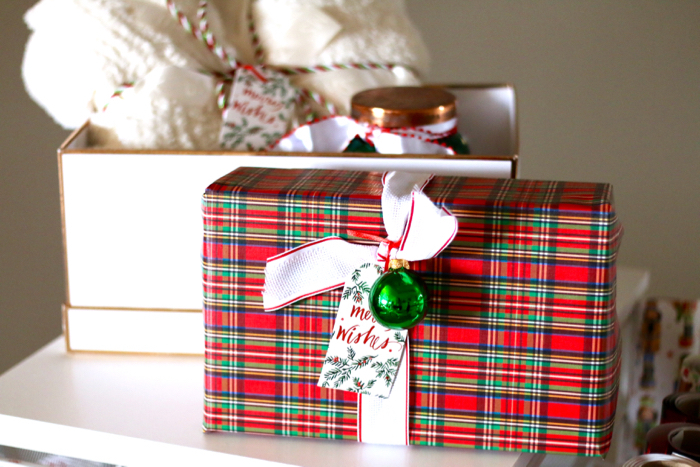 It holds your perfect rolled wrapping paper in place all year round. 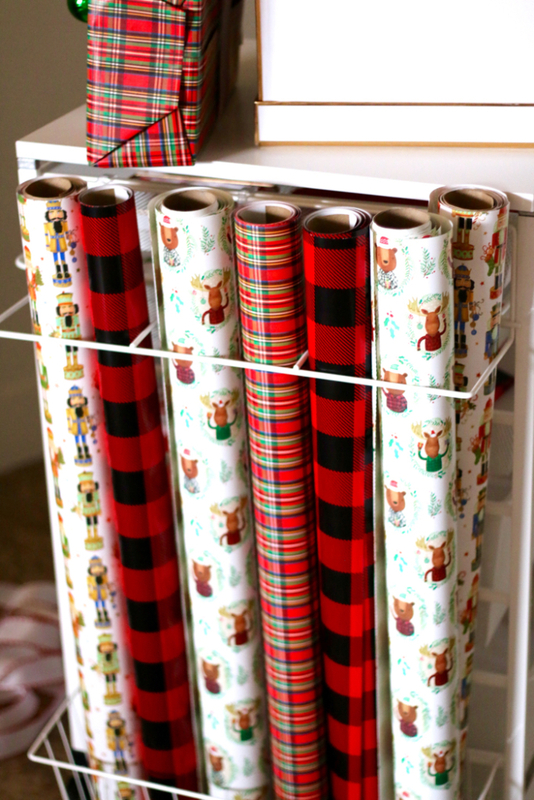 You don’t need to go out and buy more wrapping paper because you simply gave up on trying to store it! HELLO! Winning! 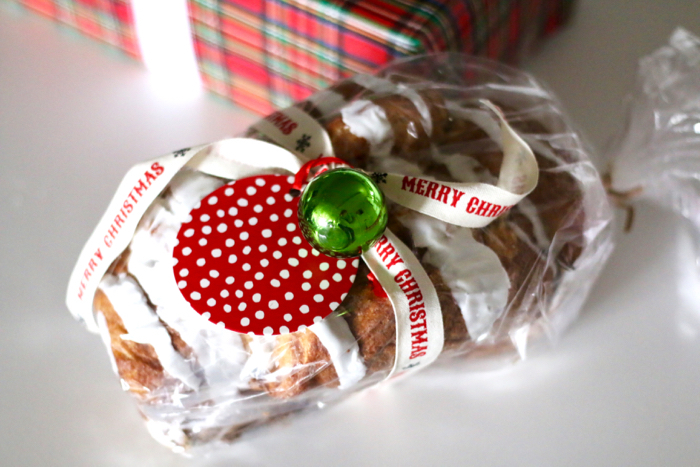 This is the best kept holiday hack ever. 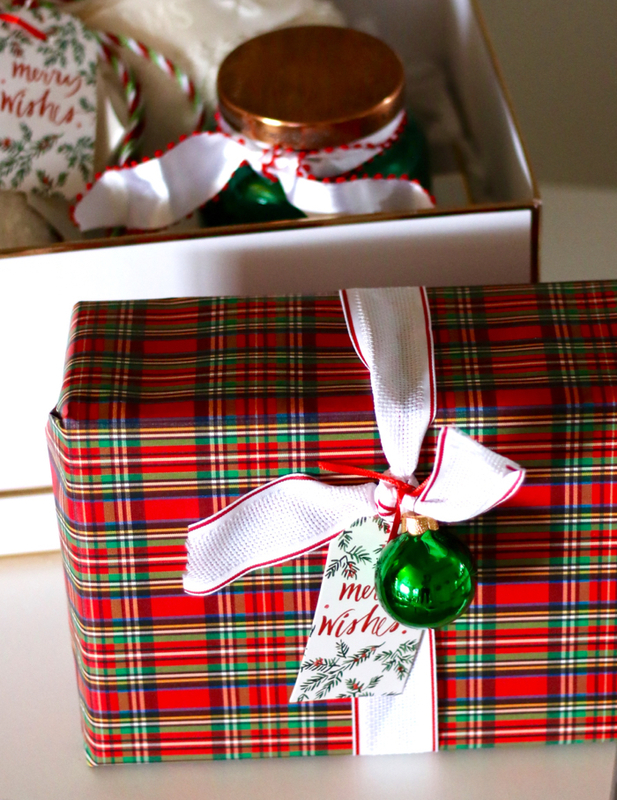 I now completely enjoy taking a few minutes each day to wrap present for my friends and family. 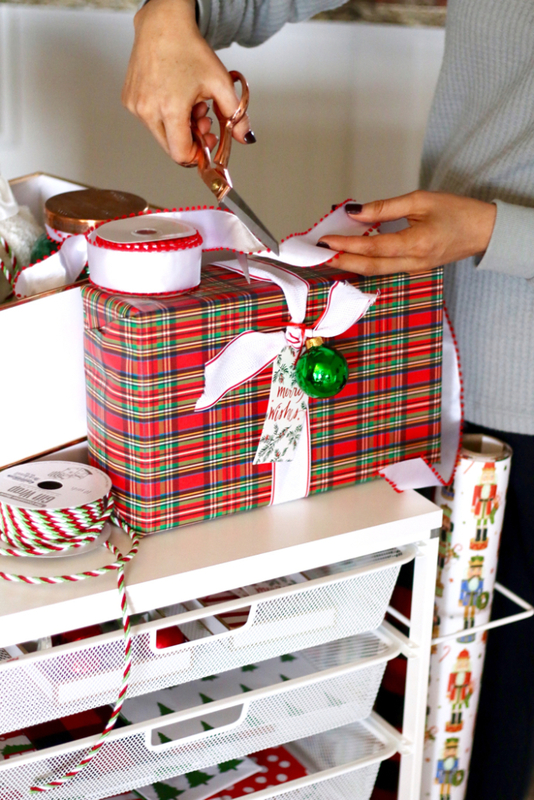 It takes so much stress away from next year knowing that I’ll be able to find all of my wrapping essentials in one place. 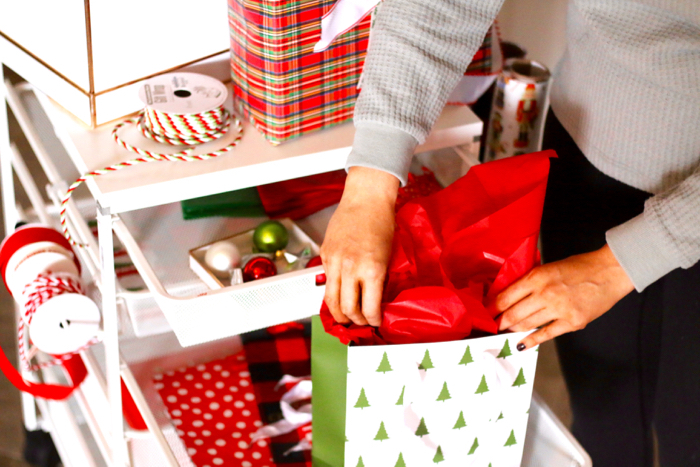 It’s also tons of fun to include the kids in our little wrapping station. They love to help out and feel a part of the holiday fun, so I love being able to spend this time with them and teach them to wrap. These times are turning into the best Christmas memories! 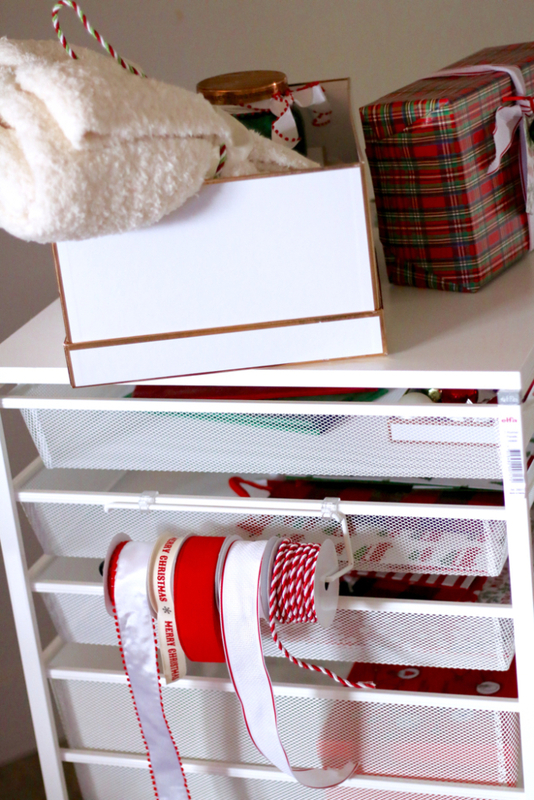 Having this little wrapping station has also helped me be able to hide presents a little better from the babies. Most times as soon as I get home from the store I just wrap the gift up and put a little note on it for which kid it’s for. This will be life saving when Christmas Eve comes around because all too often Trevor + I are up till’ the wee hours in the morning wrapping presents. 1. 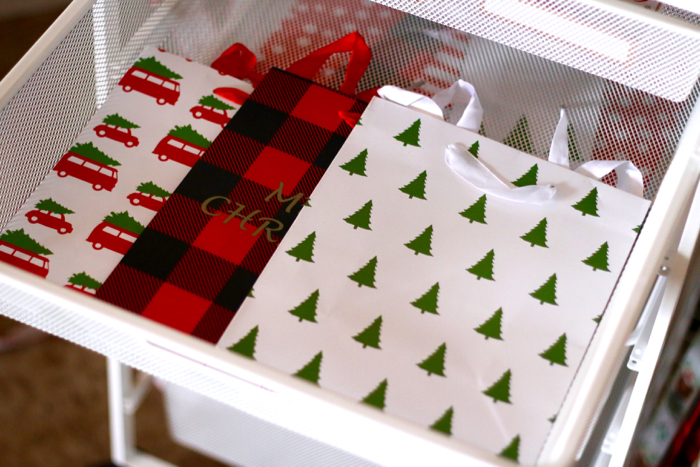 Organize all your wrapping paper and extra bows- you’ll be so happy that you took the time to do this when you go to pull out all your holiday gear next year! 2. Go through the decorations and get rid of what you don’t use and store the rest- I go through my decorations every year and get rid of some I haven’t put out in years and then I store the rest in containers. It keeps everything clean and organized! 3. Keep it simple- you can go all out and still keep it simple. The holidays are supposed to be fun and enjoyable, if you find yourself getting stressed out about wrapping or decorating, take a step back and remember to enjoy yourself! Thank you so much to The Container Store for sponsoring this post. All ideas and thoughts were my own.